Almost 2 year ago, I had posted about "Useful jQuery Text Editor Plugins" but since then some new jQuery rich text editor plugins are released so thought of updating it. So here is a complied list of latest jQuery rich text editor plugins. Enjoy!!!! jQuery TE is a jQuery plugin. It is a lightweight (19.5 KB) and very useful HTML editor. And it works with WYSIWYG model. Most importantly, it can be integrated into your system in 1 minute. And you can modify it as you want in terms of interface. Even you can change the css classes. It is the most advanced, developer-friendly, beautiful, easy-to-use and fantastic WYSIWYG to date. Incredibly simple yet powerful features for images: drag and drop them from your computer, copy and paste from an editor. 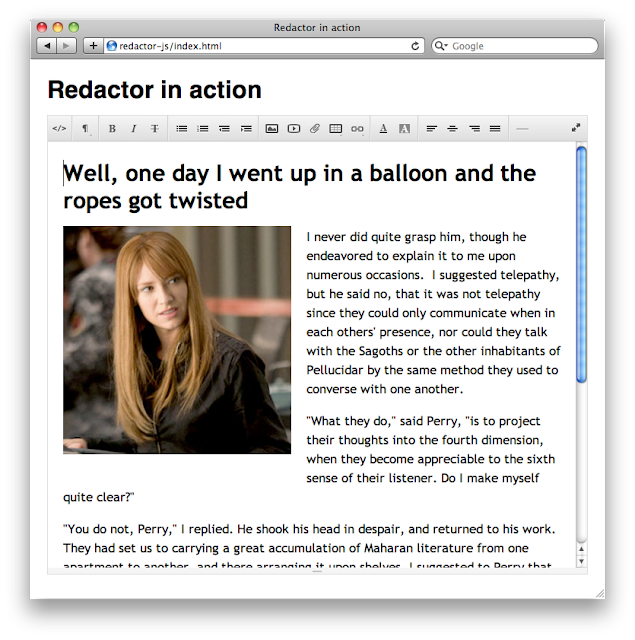 Hallo is the simplest web editor imaginable. Instead of cluttered forms or toolbars, you edit your web content as it is. Just you, your web design, and your content. LineControl allows you to add a beautiful, responsive and fast online Text Editor to your web application/site. LineControl is designed to work with Twitter Bootstrap and as a jQuery Plugin.